I'm finally back with a sports post, albeit light. Enjoy! This girl was looking for a date to her sorority formal, so she decided to make a video, reminiscent of the military members who asked Justin Timberlake and Mila Kuniz out. She, however, failed miserably. Rather than asking out Jeremy Lin, the Knicks Asian-American point guard (who went to Harverd...), she asked out Jerry Linn, a black player for the Giants...who just won the Super Bowl. Amazing. Ah-mazing. This guy has taken the internet by storm. 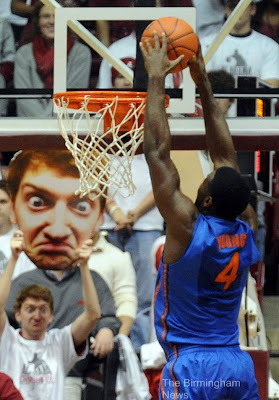 He came up with a creative behind-the-backboard-distraction sign for the Alabama/Ole Miss game on Feb. 4. The Red Wings have set a new record - they won 23 games in a row. The 22 game record was set by the Boston Bruins 8 years ago. Proud of my team! Kris Humphries is still getting booed when he plays. People are seriously booing the kid? Did they watch the overly produced Kim & Kourtney take New York? Was it not obvious that Kim Kardashian is a selfish, uncompromising person who didn't attempt to even be married?? Let the man play. This surprised me and and pretty much the rest of the country. Here's the story...in a Linfographic. All the plays on his name have been amazing. Linsanity was the first, I believe. I think my favorite is Love you Lin time.